Looking for deeper insight on markets? In tonight’s Closer sent to Bespoke Institutional clients, we take a look into the industries that we consider cyclical which have been outperforming the S&P 500 recently. This could bode well for global manufacturing finding a bottom as well as the durability of the current rally. Of these cyclical industries, we highlight autos, more specifically OEMs and parts retailers, showing how much they make up of the global indices. Turning to macro data, we evaluate today’s industrial production data which saw the March release miss estimates. We also review the quarterly estimate of weekly income for the first quarter, released by the BLS today. 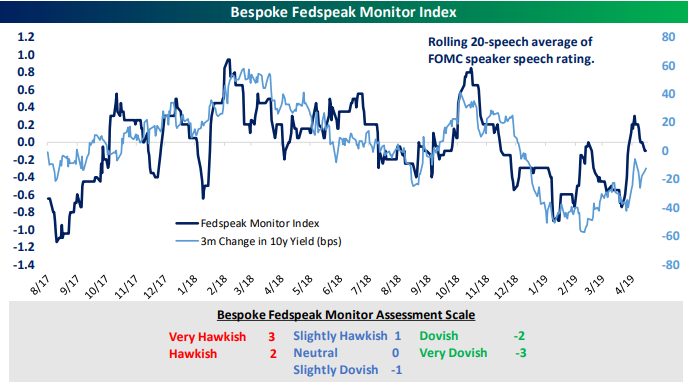 We finish with an updated look at our Fedspeak Monitor Index, which has flipped from dovish to hawkish and now is back to dovish once again.